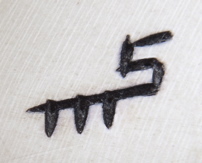 Signature - I put this mark on all of my carvings. It is the capitol letter S with three marks under the tail. My grandfather, my father, and I share the same name hence I am Norm Sartorius III. Photography by Jim Osborn.